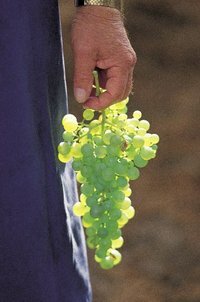 Wine event of the day: On Thur., Oct. 16 (wait, that's tonight!) Andrew Lampasone's Wine Watch of Fort Lauderdale and Bogart's Bar & Grille will host a wine dinner benefiting the Foundation of Jimmy Mancbach, the late fine wine guru for Southern Wine & Spirits. Purpose is to create scholarships to let young South Florida wine professionals study and work in California wine country. 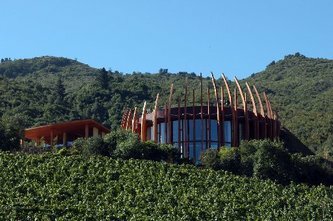 About 100 miles south of Santiago, in Chile's central valley, is a winery called Casa Lapostolle. The soil, the climate and the vineyard workers are Chilean. Everything else is French: the winery, above, the owner, the chief wine consultant, even the grapes, albeit a century or more removed. Ninety-seven percent of the wine is exported, to the United States, England, Russia and beyond. Few Chileans ever taste it. "Only the wealthy people in Santiago can afford it," says Jérôme Poisson, a French-born winemaker at Casa Lapostolle who is on a U.S.tour this fall. "Chile was never a big wine-drinking country like Argentina," Poisson says. "They drink beer or pisco or boxed wines." Chile's loss is our gain. 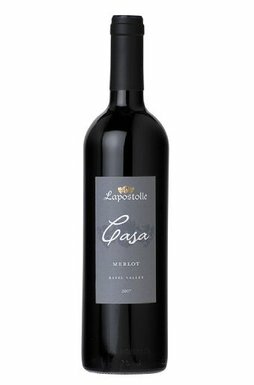 Casa Lapostolle wines are great values for the money -- from the crisp and fruity $10 sauvignon blanc to the smooth and powerful $25 Cuvée Alexandre to the shifting, complex, even savory $70 red blend of carmenère, merlot and cabernet sauvignon called Clos Apalta. The wines are the products of strong personalities, beginning with "flying winemaker'' consultant Michel Rolland. The Bordeaux winemaker guides more than 100 wineries worldwide -- and sometimes is accused of minimizing the natural differences among their products by his insistence on super-ripe grapes and extensive aging in powerfully flavored French oak barrels. "He visits three or four times a year," says Poisson. ‘‘Once before the harvest, then two or three times during blending." Blending decisions are made by Rolland, chief winemaker Jacques Begarie and French winery owner Alexandra Marnier-Lapostolle. "You need a strong personality to work with Michel Rolland," says Poisson. "But she [Alexandra] wants thelast word in blending." For example, in the 2006 vintage, the $70-a-bottle Clos Apalta wine wasn't quite up to her standards. Poisson suggested demoting some of its grapes to the $25 Cuvée Alexandre merlot eventhough it would cut Clos Apalta production from 6,000 bottles to 3,000. "She said, ‘Go ahead.' Shehas to take a long-term view of creating only the best quality." So here’s a tip: If you can score a bottle of the 2006 Cuvée Alexandre Merlot, it'll have some pretty high powered grapes. You read it here first. of melons and minerals; $10. ripe tannins, long finish; $13. If you’ve seen the new movie Bottle Shock, a Hollywood film about the famous Paris Wine Tasting of 1976 that put California on the world wine map, here’s a way to tour the locations where it was filmed. The California Travel and Tourism Commission has put together a Website with a self-guided tour of such locations as Chateau Montelena, where the winning wine was made, the real restaurant that played the role of the Aqua Vira in the movie, even balloon rides and massages. It’s a guide, not a tour. You have to make all the reservations yourself, including the almost-impossible-to-get-into restaurant French Laundry. If you go, let me know how you make out. It’s too hot for an outdoor wine festival in South Florida, so they’re holding an indoor/outdoor festival at the Village of Merrick Park on Tue., Aug. 12 from 5:30 p.m. to 8 p.m.
Wine fans will start at La Estancia Argentina with wines, appetizers and a sommelier to discuss them. Then they will walk to the Gucci shop to sip champagne while models show off Italian fashion. Then a quick outdoors jaunt while historian Arva Parks discusses the historical statues in Merrick Park. Then to Borders for coffee and live jazz. Finally to Via Quadronno for an exhibit of Humberto Bentiez’s art, with aperitifs. Sponsored by the Coral Gables Chamber of Commerce’s cultural affairs committee, it’s $30 for chamber members, $40 for non-members. To sign up, go to the Chamber Website. I enjoyed your article today about Australian wines. My husband has an office in Adelaide and when there we have spent a lot of weekends visiting wineries in Adelaide Hills, Barossa and McLaren Vale. It is just beautiful (if you have not been there), really reminds us of Tuscany. But with the Gulf of St. Vincent in the background in McLaren Vale. There is such diversity in the wineries, large, small, the type of town they are in, the food selection available (from none to a cheese platter to a full gourmet lunch or dinner), and whether or not the winery even has a cellar door. One thing is similar - if they do have a cellar door they usually have you taste at least five wines, and we've never been to a winery that charges for the tasting. One of our favorite wines, a Shiraz from Barossa, is First Drop's 'Mother's Milk'. Now there's a name! Thanks for a nice reminder of Adelaide! Sounds like a great trip. I haven't been there yet, but it's next on my list. One thing I've learned from your letter and some other reading I've just done is that Aussie wineries usually have tasting rooms -- and they call them cellar doors. Very colorful. 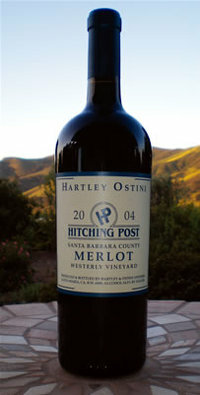 I was sort of ambivalent about merlots, liking some, not liking others, until I saw the movie Sideways a few years ago. In that movie it was severely dissed. I have not purchased a merlot since. Am I being a snob, or is merlot just misunderstood? It was a bit enigmatic when Miles, the wine snob played in the 2005 movie by Paul Giamatti, made his famous statement: “I’m not drinking any ^&%$#* merlot.” I guess he was referring to the fact that merlot, in the previous 10 years, had become so popular that growers started planting it everywhere – including some places where it didn’t do well. It was widely agreed that the wine had declined in quality. Nationwide, sales of merlot slumped. And sales of pinot noir, the wine that Miles praised, soared. “It’s amazing how much effect a little joke can have,” said Frank Ostini. It was his Hitching Post restaurant outside Santa Barbara, Calif., where the movie was filmed, and his “Highliner” pinot noir that got all the glory. Well, in the time since, merlots have recouped some of their reputation, as growers figure out where they should grow and where they shouldn’t. In fact, when Ostini came to the South Beach Wine & Food Festival last February, he brought bottles of his Highliner Pinot Noir to show off. And he brought bottles of his latest new offering: a soft and fruity merlot. Finding a present for your dad on Father’s Day is a piece of cake. We dads are sooo easy. A piece of beef, a potato and a bottle of red wine. That’s it. We don’t even need a card. We know you love us. We’re so easy you can give us the same thing every year and we’ll love it every time. Also any price range will do. If times are tough, we understand. A cheeseburger, a plate full of tater tots and a $9 bottle of Bodega Norton Malbec from Argentina will leave us purring. If we’re flush, take us to Don Shula’s for one of those 48-ounce haunches of beef the football players like to eat, and a $200 bottle of Sassicaia, that fabulous Super Tuscan wine from Italy. In fact, Shula’s website says a guy named Taft Parker – a pretty big guy, I’m betting – recently downed his 175th 48-ounce Porterhouse at the restaurant. I’ve never eaten one, but I’ve seen them. Scary. Or, maybe to be more practical, there’s a middle solution. Pick up a nice prime Beef Tenderloin, google the recipe for Steak Diane, slathered with heavy cream, nestled in mushrooms, flambéed with brandy, open a nice merlot/carmenere blend from Chile, the Casa Lapostolle Cuvee Alexandre, at only about $25. Finally, you should keep in mind -- if the father you’re treating is your husband -- that all that beef and Burgundy are likely to put us in a romantic mood. That works every year too.